. Published on Monday, May 1, 2017 . Makeup shopping can be expensive. Especially if you are a first-time makeup purchaser, it can leave a large hole in your wallet if you are trying to purchase everything you need for a full-face look at once. As a freelance makeup artist (MUA), I’m often providing my clients with affordable product suggestions for the products I use to create their look. Now, I’m happy to share my list of best drugstore makeup for your money and explain why they have become my go-to faves. This silky, smooth primer is every oily-skinned persons’ BFF. NYX Angel Veil primer helps to control oil while minimizing the appearance of pores. It also creates the perfect canvas before applying your foundations, so if you have any texture to your skin, this will help to smooth your skin and prep it for a perfect makeup application. If you’re a fan of Benefit’s Brow Zings, then this purchase is a no-brainer. For only $3, the e.l.f. Eyebrow Kit is a perfect dupe for the $32 Brow Zings. On the left side of the pan is the gel, which is used to shape your brows. On the right side is the brow powder used to fill in sparse areas in your brows. I personally think the best application is when you mix both the gel and the powder together. Here is a great demonstration of the application process. (Note: This video is using Brow Zings, but you can use the e.l.f. Eyebrow Kit the same way). This is by far my all-time favorite drugstore concealer, and comes in second place in my ride or die concealers list (Tarte Shapetape Contour Concealer is my number one). First off, this formula is everything you’d want in a concealer. It has impeccable coverage, it’s easy to blend, it’s great for all skin types and it doesn’t crease in your fine lines. Need I say more?! OK, fine, I will. I love the packaging. I don’t care what the reviews say, I LOVE that it has a sponge tip. All you have to do is twist the top and the product comes out through the sponge tip. If it’s your personal concealer, you can apply it directly to your face. When I use this product on my clients, I actually remove the sponge tip and apply the product to my stainless-steel makeup palette. Here’s how you can safely remove the sponge tip. (This video was painful for me to watch, but it gets the point across lol). I also recommend blending out this product with a damp beauty sponge for the best results. If that still isn’t enough to convince you how amazing this product is, it can also double as an eyeshadow primer. Apply a little to your eyelid with a concealer brush, then set it with a translucent setting powder and you’re ready to apply your eyeshadow! Do you have dry, oily or normal skin? Are you seeking a full-coverage look? Then this is the foundation for you! L’Oréal has slayed the foundation game with their Infallible collection, offering something for every skin type. The Pro-Matte is my go-to foundation. I have extremely oily skin and this foundation is one of the only foundations that keeps me looking matte all day. It’s also medium to full-coverage, so depending on how you apply it and how much you apply will get you your desired coverage. The Pro-Glow is ideal for my dry-skinned folks. The Pro-Glow offers medium to full coverage while still giving your skin a radiant glow. Is the coverage from the Pro-Matte and Pro-Glow not enough? Then you need to mix in the Total Coverage*! Literally, you need to mix the Total Coverage with either the Pro-Matte, Pro-Glow or both. Since I’m so oily, I prefer to mix one part Pro-Matte to one part Total Coverage. Use a mixing palette to blend the combination with a spatula before applying to the skin. Please note that the only reason I added the Total Coverage to this list is because it is a perfect product when mixed with the other two foundations. Unfortunately, the Total Coverage doesn’t hold all day on its own. After about five to six hours, it starts to break up on your skin. Don’t believe me? Watch this. Quality liquid lipsticks can be hard to come by. Some are too moist, some are too dry. Some are way overpriced, or don’t offer the color payoff. Therefore, finding a quality drugstore liquid lipstick can definitely be a challenge. Don’t get me wrong, there are affordable liquid lipsticks out there, but not necessarily conveniently located at your neighborhood drugstore. With that being said, the Wet n Wild liquid lipsticks meet my criteria for a quality drugstore product. First, they are opaque. Just one swatch and you get the color you were hoping for. Next, they are matte. When you press your lips together, there isn’t that awkward stickiness. These truly will dry to a matte finish. Lastly, they are long wearing. No need to worry about this liquid lip transferring onto anything, or anyone. Just make sure you have it with you for touch ups after you eat anything greasy (e.g. french fries, buttered popcorn, etc.). I feel like I hit the jackpot when I found these! Faux mink lashes can be pretty pricey, but they look so much better than the cheap ones made of Polyester. 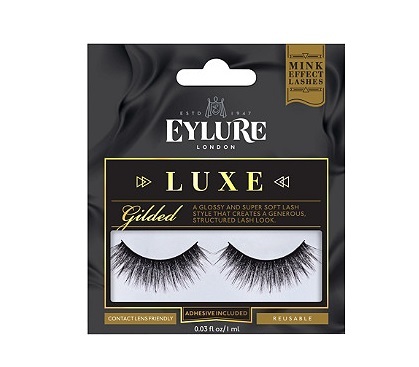 The Eylure Luxe Faux Mink Lashes are my new favorite false lashes. They are fluffy, full and natural looking—and by natural, I mean the single strands of lashes look like real eyelashes, not fake, plastic strips. The band is also flexible and lies easily along your lashline for a seamless look. My favorite style is the Baroque, which are short in the inner corners then fan out on the outer corners. I was never one for blush. I grew up the in ‘90s and was wearing makeup in the early ‘00s, where it was perfectly acceptable to have no definition between your cheeks and jawline. (See photo of ‘90s it-girl Jennie Garth below). That was the style, don’t judge me! Anyway, blush has been revived from the ‘80s and was seen all over the runway during New York Fashion Week. I, too, have finally found my love connection to blush with the Japonesque Color Velvet Touch Blush in No. 3. This blush is so velvety smooth, it applies like a dream! This blush also has a slight radiance to it, so it leaves your skin looking fresh and hydrated. It’s lightweight and builds to perfection. I love applying this over my bronzer and topping it with a highlighter. Unfortunately, I have yet to find a quality liquid liner from the drugstore. But I do have a favorite gel liner! The L’Oréal Infallible Gel Lacquer Liner glides on smoothly and applies jet black (I have the color Blackest Black). It is also packaged with a brush that works well when creating a thin line on your upper or lower lashline. This liner is also perfect to use in your waterline! PRO TIP: Set the gel liner on your waterline with an eyeshadow that matches the color of the liner for an even longer lasting effect! Now I know the Japonesque blush I shared was pretty expensive for being a drugstore brand, so here is another option at a more affordable price. The e.l.f. Contouring Blush & Bronzing Powder is the perfect duo for someone balling on a budget, but wants quality makeup. The split pan offers a contouring bronzer, which applies like butter in the hollows of your cheeks and the defining points of your face, giving your skin the perfect glow. The blush in the St. Lucia palette brings the color back into your skin along with a radiant glow. There are two more colors offered in this palette, but the St. Lucia is my favorite. I know this is a drugstore product story, but would it really hurt anyone if I mention two products that are MUST-HAVES at a drugstore price? Didn’t think so. This finely milled no color powder does it all. I set with it, bake with it and I even use it as a barrier for fallout. The No Color Powder also minimizes the potential for photo flashback. Whether you have dry skin, or oily skin, this powder provides the versatility every MUA needs. Not to mention, this 3 oz packages goes such a long way! If you do not own this palette, please stop reading, click here and purchase it NOW! This is by far my favorite makeup product of all time. First off, the colors in this palette are to die for! It is perfect for creating a natural, day-time look or a rich, smoky eye for an evening out on the town. You can wear these colors any time of year and compliments will be flowing your way. Trust me, I know from experience. Next, the quality of these shadows can be compared to MAC eyeshadows. They have strong pigmentation, creamy blendability and minimal fallout. Finally (and probably the best part), this entire palette is only $22.99! Can you believe it?! You get 35 colors at about $1.52 per pan. This literally blows my mind! I love this palette so much, I even purchased it in the all matte version and all shimmer version. That concludes my list of best drugstore makeup for your money. Did your favorites not make the list? Share with us using #CampusCropChat on Facebook, Twitter and Instagram! And be sure to follow us on Snapchat @ASICPP to stay up to date with everything ASI.